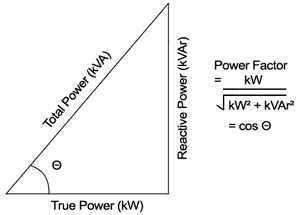 What is Power Factor and Power Triangle? Simply stated, the Power Factor is the percentage of Apparent Power that does real work. To understand power factor in an electrical system, first of all, we should have the knowledge of some basic terms which are used in an electrical system given below. kW – Working Power (also called Actual Power or Active Power or Real Power):- It is the power that actually powers the equipment and performs useful work. kVAR – Reactive Power:- It is the power that magnetic equipment (transformer, motor, and relay)needs to produce the magnetizing flux. 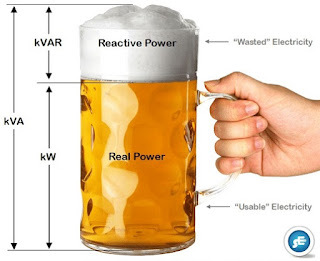 kVA – Apparent Power:- It is the “vectorial summation” of KVAR and KW. Are you confused about these terms? It is better to understand these term with some simple analogy. Let’s say you are at the park and it is a really hot day. You order up a mug of beer. The thirst-quenching portion of your beer is represented by KW. This is the usable power. Along with your beer comes a little bit of foam. (And that foam just doesn’t quench your thirst.) This foam is represented by KVAR. This part is the wasted power. So, we understood some basic terms from the beer mug analogy. 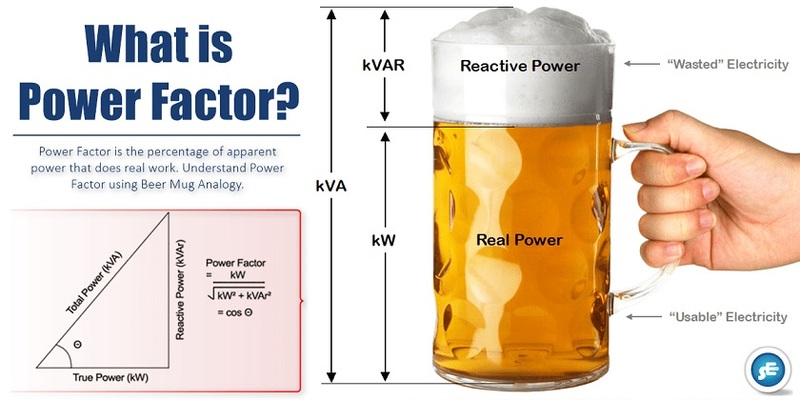 Power Factor (Cos Φ) is the ratio of Working Power (True Power) to Apparent Power. Looking at our beer mug analogy above, the power factor would be the ratio of beer (KW) to beer plus foam (KVA). So, In order to have an “efficient” system, we want the power factor to be as close to 1.0 as possible. A power factor of one or “unity power factor” is the goal of any electric utility company. It is because if the power factor is less than one, they have to supply more current to the user for a given amount of power use. In so doing, they incur more line losses.